Today is the day! Luminair 3 is now available across the globe on Apple’s App Store. 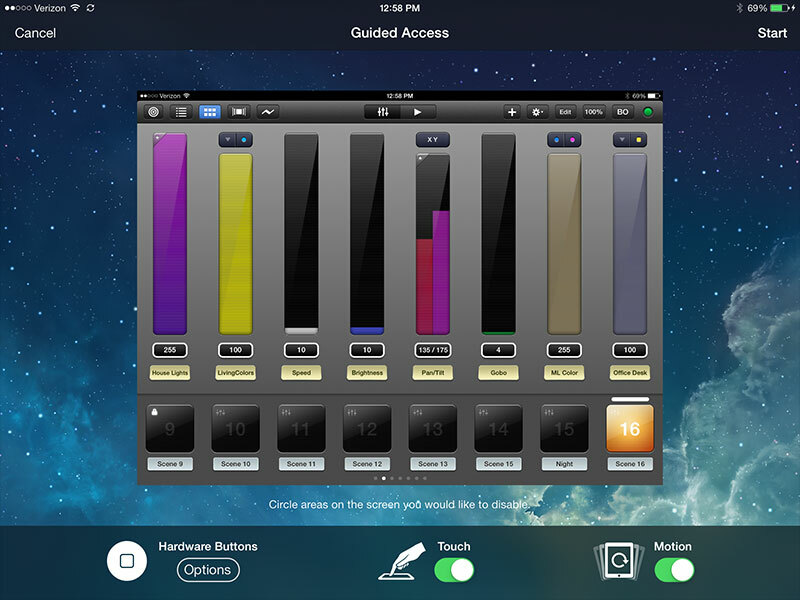 Luminair 3 is a brand new app for all iOS 8 devices with a redesigned user interface, LTP faders, a movement generator/FX engine, built-in Scheduling, Luminair Remote for Apple Watch, MIDI over Bluetooth LE, and tons of other new features and improvements. Full information on Luminair 3 can be found on the updated web site. A special 20%-off launch price for Luminair 3 is being offered at 79.99 USD (this price will vary depending on which country you are located in). Additional In-App purchases (Location Pro, Schedule Pro, MIDI Pro) are also being offered at special launch prices for a limited time at $9.99 USD each. More details will be revealed as we approach release. Please follow us on Twitter, Facebook, Instagram for the latest videos and screenshots. It’s becoming really common in architecture, displays, museums, installations and more to use apps like Luminair installed on a central device in a fixed location, like a wall or on a specialized device stand. iOS devices benefit from a fantastic 3rd-party accessory ecosystem, and there’s some really nice products available for mounting devices from companies like Heckler Design, iPort, and many more. It’s a great pleasure to announce that Luminair v2.5 is now available on the App Store, as free updates to the existing Luminair for iPad and iPhone apps. Despite it’s .5 versioning, this is probably the biggest update Luminair has ever received. For the first time ever, Luminair’s codebase is now unified across all iOS devices*. Luminair running on an iPhone is actually a brand new app, now based upon Luminair for iPad’s award-winning design, with a new UI optimized for 4″ iPhone screens on the 5, 5s, 5c, and 5th generation iPod touch. It now benefits from core-feature compatibility with Luminair running on an iPad, as well as iCloud syncing between all iOS device types. As a result, you’re feedback has been answered. Luminair for iPad is now a universal app, newly renamed as Luminair for iOS. The iPhone-only version has also been updated to v2.5 and will still be offered for those of you not interested in using an iPad. One of the biggest new features in Luminair 2.5 is support for controlling Philips Hue lights right alongside DMX-controlled lighting. While these are mostly home-focused products with limitations compared to DMX-controlled lights, we think they can be utilized as design elements in things like film and TV production and architectural lighting, as well as by enthusiasts who’d like to mix and match different types of lights. Smart lights like Hue are one of the next logical steps with LED lighting control, and we intend to continue to add additional support and features for these systems in the future. Ultimately they are another tool for your designs, and we can’t wait to see the way that you use them. The next major feature to be added is one that’s probably been requested more than any other feature since Luminair for iPad was originally released. That feature is a new Sound Active mode, part of the new Timing FX options, located in the Stacks mode toolbar. Sound Active mode can detect sounds from the built-in microphone and other audio input hardware to trigger lights show synced to music. But we did not stop there. The new Sound Active mode also supports Inter-App Audio (IAA) on iOS 7. Luminair can receive sound from IAA supported apps to trigger your light shows. IAA is brand new on iOS 7, and new apps are being added frequently that support this functionality. For all of you iPad DJ’s out there, Algroriddm’s djay 2 already supports IAA, so you can use it as your playback source for Luminair. Many of you are eager to hear news of what’s next with Luminair. With the release of iOS 7 today, here’s just a little status update. First of all, the existing Luminair apps have been tested and will run on iOS 7, with some minor UI issues here and there. If you encounter any issues on iOS 7, please go ahead and report them to support. Now for the status update on what’s next. Sometime in the next few weeks, Luminair v2.5 will be released simultaneously for iPad and iPhone as free updates to the existing apps. v2.5 has been under development for some time, and since this past June has been developed under the new iOS 7 SDK in preparation for this Fall release. This is an exciting update for reasons that are yet to be revealed (sorry! ), and you’re really going to enjoy the new features. More info on v2.5 will be available before it’s release, so please continue to check our news page, as well as our Twitter and Facebook pages.